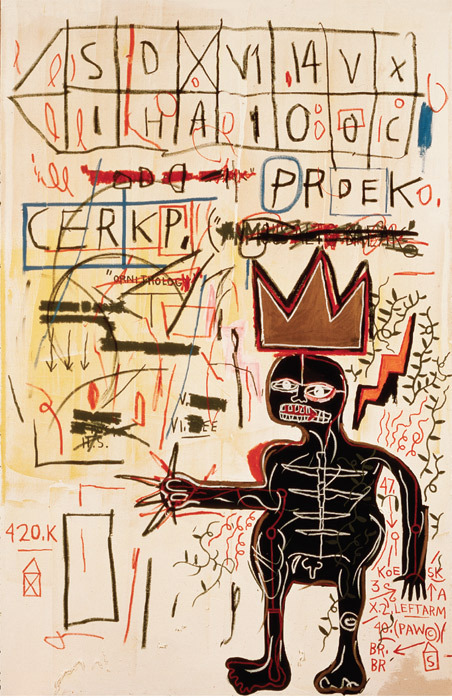 Jean-Michel Basquiat, With Strings Two, 1983, acrylic and mixed media on canvas, 96 x 60". I’ve never seen a commercial gallery show as well attended as this exhibition of nearly sixty works by Jean-Michel Basquiat. The artist was once a divisive figure, but no more: The crowds who poured in to see his work didn’t imagine they were coming to see something controversial. They were coming to see the work of a legend, a man whose life has been endowed by the press and cinema with all the tragic glamour of a James Dean or Jimi Hendrix or Kurt Cobain. But they also saw art that has turned out to have far more staying power than many would have once predicted.